LISTEN to simple songs and classical pieces and complete exercises to learn about notes, instruments, scales, dynamics, chords, tempo, and intervals. ANSWER level 1 basic questions such as whether notes are going up or down. Advanced levels help you identify tempo: Allegro, Adagio, Moderato, and dynamics: Forte, Piano, Crescendo, and Diminuendo. 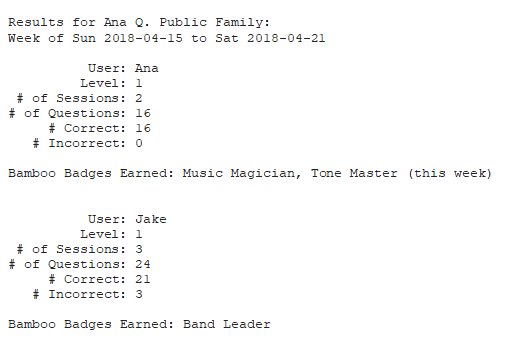 EARN a Master Conductor Badge by identifying clarinet, harp, cymbals, cello, and other instruments. HAVE FUN competing with family and friends as you collect badges and move up to new levels. The most wonderful thing is that Bamboo Music really got my daughters excited to actually learn how to play an instrument, and this year, they enrolled in ukulele and piano lessons. And now, they’ve continued to use Bamboo as part of their music curriculum. As a teacher myself, it’s awesome to see that Bamboo knows and keeps track of what each member of my family is learning, and makes the questions harder as they reach new levels. Jack Frierson from Brooklyn, New York studied Jazz Performance at The New School in New York City. Your browser does not support the audio element. Feedback on Bamboo Music from Jack Frierson, a jazz musician from Brooklyn, New York. Listen to Jack use Bamboo Music. He does such a great job, he even earns a Pianissimo Badge!